Why Order a Custom DIY Garage Storage Unit? A custom DIY garage storage unit offers a convenient and secure building in which you can store items ranging from vehicles and tools to stock and inventory. Building it yourself provides cost savings when compared to the use of professional contractors, while the use of stainless steel as a building material means that your DIY garage storage unit will be fire resistant, as well as weatherproof. Steel is also the material of choice in any construction project where security and durability matter the most. Because steel is fire resistant, you can use your new DIY garage storage unit for purposes such as a welding shop or mechanic’s workshop. These kind of applications can pose a threat to buildings that are made from wood, and other combustible materials, but this will not be a problem for those individuals and businesses with a steel building. Despite this, the storage unit will be thermally efficient, electrics can be safely installed, and additional insulation can also be added. Not only is stainless steel fire resistant, but it is also weather resistant. It will not warp in the strong sun, and it won’t rust in the rain or snow. A DIY garage storage unit that is well constructed, following the instructions provided, will also be resistant to all but the most powerful of storms. Not only is steel a strong and durable material, but it is difficult to break through, and specialist tools would be required by any thief looking to get inside and take items out. Access points are made from the same toughened steel, and the use of modern and secure locks further enhances the security of the building. If you’re using a DIY garage storage unit to hold anything of value, whether it is of financial or sentimental value, then this level of security is vital. 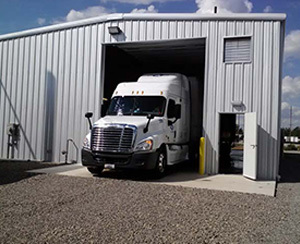 Everybody has different requirements from their garage and storage units, and whether you are limited for space or you have acres in which to build, you can have a design that is customized perfectly to your situation and to your requirements. This means that you can provide all of the storage room that you need, have room in which to work, and you can ensure that the dimensions of your DIY garage storage unit will fit neatly into the space that it belongs. Using contractors to build your garage storage unit can prove costly. You will usually pay for a team of contractors, at least one site manager, and other professionals to help ensure that the construction is erected properly, safely, and securely. With a DIY garage storage unit, however, you complete the work yourself. The plans and materials are designed and manufactured to offer a simple and quick installation, that can be followed by virtually anybody, and you won’t have to pay the prices that are demanded by many construction professionals. A custom DIY garage storage unit has many potential uses. Whether you run your own business, require storage for a couple of classic cars, or even if you need somewhere to house antique farm machinery, a stainless steel self-build unit can be customized to your requirements, erected quickly and easily, and provide you with all of the necessary functions of the building.